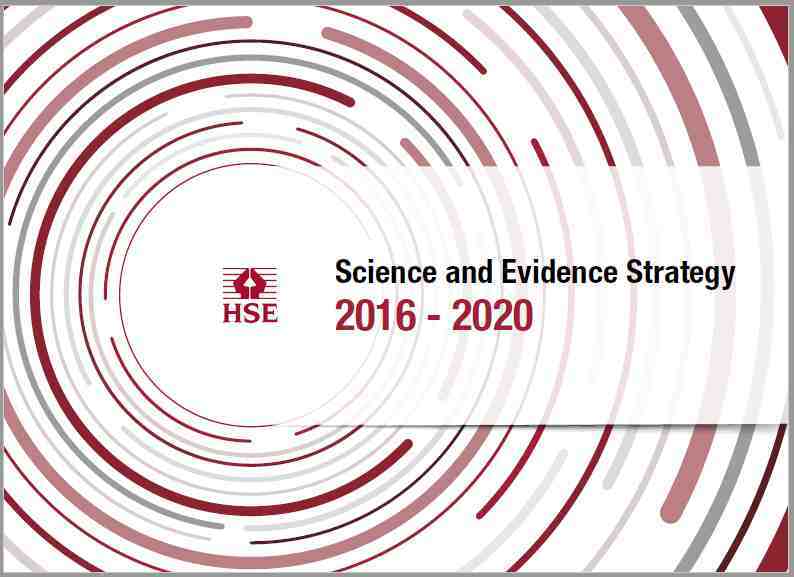 HSE's science and evidence strategy is predicated on the use and development of practical, solution-oriented science. In our strategy we set out our 'science and evidence cycle': anticipating challenges to health and safety; providing robust evidence for effective risk control; underpinning regulatory policy and operational decisions; protecting workers and safeguarding the public by developing interventions; and catalysing engagement within the health and safety system and improving performance. HSE Science and Research is published in reports, scientific journals and conference proceedings, and trade and professional magazines etc. This science and research is primarily carried out by our specialists at our Buxton laboratory, Bootle headquarters, and our Chemicals Regulations Division, (CRD) in York. Additionally we publish reports on science and research that we have commissioned from other organisations. HSE scientists also produce the Methods for the Determination of Hazardous Substances. The Diffusive Monitor was published until 2008 by the HSE Committee on Analytical Requirements. HSE Bootle Head Office. HSE Buxton Laboratory. HSE York CRD. All HSE Research Reports are open access. From 1st January 2014, open access applies to the vast majority of peer-reviewed journal papers describing HSE-led and funded research. Copies of published papers and articles that are not open access can be obtained through your public, academic or company library service. If you do not have access to such services please contact the British Library Document Supply Centre, use British Library online at www.bl.uk. A bibliography of all HSE science and research publications from 2016 onwards is given at the links opposite. This includes publications on science and research done by HSE specialists on a commercial basis for other Government departments, industry and other organisations. To access specific reports that are not listed please contact the HSE Advice Team. A bibliography of all science and research publications for HSE's former agency, the Health and Safety Laboratory (HSL) is given at the links opposite for the years 2002-2014. Please note that any HSL reports published in the HSE Research Reports series from 2002 onwards are available as free downloads at http://www.hse.gov.uk/research/rrhtm/index.htm.